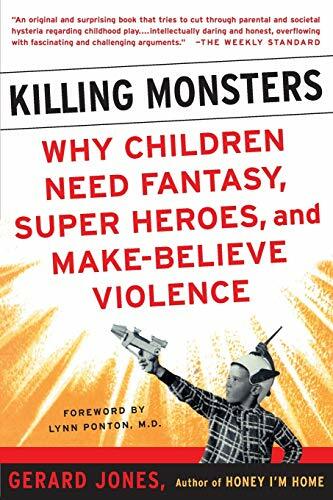 Killing Monsters: Why Children Need Fantasy, Super Heroes, and Make-Believe Violence by Gerard Jones is an engrossing reflection on the importance of superheroes and fantasy violence in the lives of children and youth. Jones argues for the necessity of fantasized violence for the development of a sense of personal power and for the working through of stress, anger, fear and frustration. Killing Monsters is the outcome of the author experience with children and youth in his career as a comic book designer and workshop leader. Jones theorizes that children and youth need fantasize violence and that it is a natural occurrence. The fantasies allow the young person to cope with anger, fear, frustration, pressure and stress that the child senses is inappropriate to express. Fantasy violence in the guise of storytelling, art, play, music, and video games allows the young person to experience their emotions in a safe and cathartic manner. In today’s post-Columbine world, however, parents and teachers are fearful about the impact of media violence on young people. He theorizes that in an attempt to eliminate the potential threat of violent acts by children and teens, adult who restrict young people’s need to express their very real feelings of frustration, fear, and anger inadvertently place road blocks in the path of the young people from find socially accepted ways to channel their feelings. The temporarily repression of these “negative feelings” only forces them to burst forth later inappropriately in uncontrolled rage. The use of fantasy to express and feel these emotions allows the child to channel the feelings into less destructive means. Destroying a monster that is an imaginary surrogate for a real person, allows a child to express their feelings, gain a sense of personal power, and find release in a socially acceptable manner. Jones does, however, point out that for some children and teens the line between fantasy and reality remains in an infantile blurred state. It is for these young people that imagined violence may become a rehearsal for real violence. Killing Monsters at times reads like a “one-note (or chapter) Charlie” book. The author takes his basic theory – imagined violence is natural and healthy – rehashes it by type of media or type of person (child, female, abused, etc.). One chapter focuses on video games while another focuses on movies. One chapter looks exclusively at imagined violence from the female perspective. There are times that this reviewer felt as if I had just read this in the previous chapter. I asked myself why say it again, you just said this, but each chapter is unique and addresses the issue from a slightly different perspective. The book also gives good advice to parents and teachers dealing with young people. It discusses the powerful influence of parents in modeling, mirroring, and mentoring their children. Throughout it points out the red flags to note in children that might indicate the presence of a harmful relationship to violence. The author advises that adults should not confuse or try to impress their attitude about real violence upon children’s views about imaginary violence. He can not shout loud enough that real is real and fantasy is not. By enlarge, children know the difference, but it is adult that confuse the issue and thus send confusing messages to children. The works focuses primarily on today’s children and youth. While there is some historic perspective, I would have liked to read more about earlier generations. It would have been interesting to compare the stories of today’s youth with those of the WWII generation or the Vietnam/Sixties generation. It would have been interesting to care the study further to reflect upon the impact of childhood fantasy violence or lack there of on grownups. For example, did imagined violence assist soldiers to cope during war? Did girls raise in earlier traditional society express more or less violent imaginings? What type of violent imagines produced soldiers, police, or criminals? These are a few of “my” questions for the author, however, he was happy addressing children and youth born post -1980, that of course is his option as an author. Perhaps, he will choose to explore these issues as his own son, the laboratory for much of his research, grows into adulthood. Time will tell. If not, I wish another author would pick up this theme and carry it further. The fact that I am so interested is a good indicator how well the author writes and how well he invites thought and encourages investigation. Killing Monsters is VERY thought provoking book. Written for the layperson it is definitely appropriate for academic use. (It would, however, be improved by a bibliography.) It should definitely have people talking. Read it and you can talk about it too! I recommend this book.